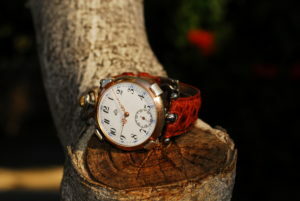 Revenant watches are time pieces long forgotten or brought back from the brink of death. Timeless pieces, which were, hand crafted by expert horologists from, the early 1600s until around the 1950s. The pocket watch died out with the adaption of the wristwatch. More convenient smaller and a “move with the times”. Often supplemented with cheaper materials and more affordable to the masses. Technology increased and automation took over in many circumstances. 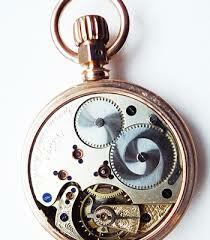 There are two main styles of pocket watch, the hunter-case pocket watch, and the open-face pocket watch. An open-faced, or Lépine, watch, is one in which the case lacks a metal cover to protect the crystal. It is typical for an open-faced watch to have the pendant located at 12:00 and the sub-second dial located at 6:00. Occasionally, a watch movement intended for a hunting case (with the winding stem at 3:00 and sub second dial at 6:00) will have an open-faced case. Such watch is known as a “sidewinder.” Alternatively, such a watch movement may be fitted with a so-called conversion dial, which relocates the winding stem to 12:00 and the sub-second dial to 3:00. After 1908, watches approved for railroad service were required to be cased in open-faced cases with the winding stem at 12:00. A hunter-case pocket watch is a case with a spring-hinged circular metal lid or cover, that closes over the watch-dial and crystal, protecting them from dust, scratches and other damage or debris. The name originated from England where “fox hunting men found it convenient to be able to open their watch and read the time with one hand, while holding the reins of their ‘hunter’ (horse) in the other hand”. It is also known as a “savonnette”, after the French word for soap (savon) due to its resemblance with a round soap bar. The majority of antique and vintage hunter-case watches have the lid-hinges at the 9 o’clock position and the stem, crown and bow of the watch at the 3 o’clock position. 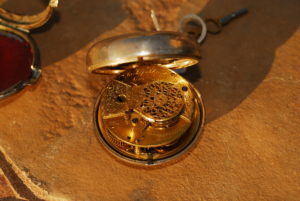 Modern hunter-case pocket watches usually have the hinges for the lid at the 6 o’clock position and the stem, crown and bow at the 12 o’clock position, as with open-face watches. In both styles of watch-cases, the sub-seconds dial was always at the 6 o’clock position. 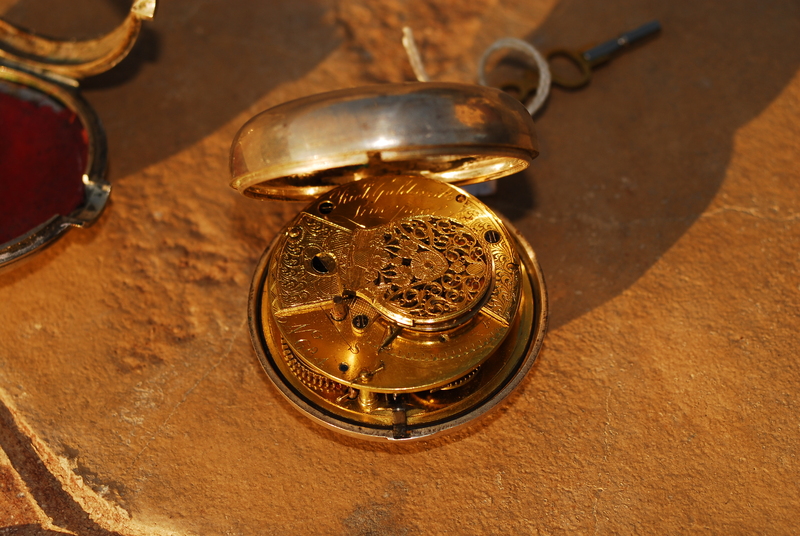 A hunter-case pocket watch with a spring-ring chain is pictured at the top of this page. The very first pocket watches, since their creation in the 16th century, up until the third quarter of the 19th century, had key-wind and key-set movements. A watch key was necessary to wind the watch and to set the time. 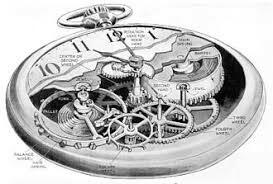 This was usually done by opening the caseback and putting the key over the winding-arbor (which was set over the watch’s winding-wheel, to wind the mainspring) or by putting the key onto the setting-arbor, which was connected with the minute-wheel and turned the hands. Some watches of this period had the setting-arbor at the front of the watch, so that removing the crystal and bezel was necessary to set the time. Watch keys are the origin of the class key, common paraphernalia for American high-school and university graduation. The ca. 1950 Omega pocket watch is of stem-wind, stem-set movement. The mainstream transition to the use of stem-wind, stem-set watches occurred at around the same time as the end of the manufacture and use of the fusee watch. Fusee chain-driven timing was replaced with a mainspring of better quality spring steel (commonly known as the “going barrel”) allowing for a more even release of power to the escape mechanism. However the reader of this article should not be misled to think that the winding and setting functions are directly related to the balance wheel and balance spring. The balance wheel and balance spring provide a separate function: to regulate the timing (or escape) of the movement. Mandatory for all railroad watches after roughly 1908, this kind of pocket watch was set by opening the crystal and bezel and pulling out the setting-lever (most hunter-cases have levers accessible without removing the crystal or bezel), which was generally found at either the 10 or 2 o’clock positions on open-faced watches, and at 5:00 on hunting cased watches. Once the lever was pulled out, the crown could be turned to set the time. The lever was then pushed back in and the crystal and bezel were closed over the dial again. This method of time setting on pocket watches was preferred by American and Canadian railroads, as lever setting watches make accidental time changes impossible. After 1908, lever setting was generally required for new watches entering service on American railroads. Much like the lever-set movements, these pocket watches had a small pin or knob next to the watch-stem that had to be depressed before turning the crown to set the time and releasing the pin when the correct time had been set. This style of watch is occasionally referred to as “nail set”, as the set button must be pressed using a finger. The most common types of jewels are hole jewels. Hole jewels are disks (normally flying saucer shaped) which have a carefully shaped and sized hole. The pivot of an arbor rides in this hole. The jewel provides an extremely smooth and hard surface which is very wear resistant, and when properly lubricated, very low friction. Thus, hole jewels both reduce friction and wear on the moving parts of a watch. Cap jewels are always paired with hole jewels, and always with a conically shaped pivot. The cap jewels are so called because they “cap” the hole jewels and control the axial movement of the arbor, preventing the shoulder of the pivot contacting the hole jewel. For a properly designed hole and cap jewel system, the arbor pivot bears on the cap jewel as a pin point on a thin film of oil. Thus, a hole and cap jewel offer lower friction and better performance across different positions compared with simply a hole jewel. The roller jewel, also called the impulse jewel or simply impulse pin, is a thin rod of ruby or sapphire, usually in the shape of a letter “D”. The roller jewel is responsible for coupling the motion of the balance wheel to that of the pallet fork. A jeweled watch with a lever escapement should contain at least 7 jewels. The seven jewels are; 2 hole jewels and 2 cap jewels for the pivots of the balance wheel staff (arbor), one impulse (roller) jewel, and 2 pallet jewels. Isochronism (the ability of the watch to keep time, regardless of the mainspring’s level of tension). Early watches used a solid steel balance. As temperature increased, the solid balance expanded in size, changing the moment of inertia and changing the timing of the watch. In addition, the hairspring would lengthen, decreasing its spring constant. This problem was initially solved through the use of the compensation balance. The compensation balance consisted of a ring of steel sandwiched to a ring of brass. These rings were then split in two places. The balance would, at least theoretically, actually decrease in size with heating to compensate for the lengthening of the hairspring. Through careful adjustment of the placement of the balance screws (brass or gold screws placed in the rim of the balance), a watch could be adjusted to keep time the same at both hot (100 °F) and cold (32°) temperatures. Unfortunately, a watch so adjusted would run slow at temperatures between these two. The problem was completely solved through the use of special alloys for the balance and hairspring which were essentially immune to thermal expansion. Such an alloy is used in Hamilton’s 992E and 992B. Isochronism was occasionally improved through the use of a stopworks, a system designed to only allow the mainspring to operate within its center (most consistent) range. 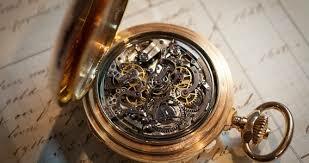 The most common method of achieving isochronism is through the use of the Breguet overcoil. which places part of the outermost turn of the hairspring in a different plane from the rest of the spring. This allows the hairspring to “breathe” more evenly and symmetrically. Two types of overcoils are found – the gradual overcoil and the Z-Bend. The gradual overcoil is obtained by imposing a two gradual twists to the hairspring, forming the rise to the second plane over half the circumference; and the Z-bend does this by imposing two kinks of complementary 45 degree angles, accomplishing a rise to the second plane in about three spring section heights. The second method is done for esthetic reasons and is much more difficult to perform. Due to the difficulty with forming an overcoil, modern watches often use a slightly less effective “dogleg”, which uses a series of sharp bends (in plane) to place part of the outermost coil out of the way of the rest of the spring. 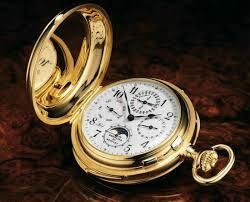 Pocket watches are not common in modern times, having been superseded by wristwatches. Up until the start of the 20th century, though, the pocket watch was predominant and the wristwatch was considered feminine and unmanly. In men’s fashions, pocket watches began to be superseded by wristwatches around the time of World War I, when officers in the field began to appreciate that a watch worn on the wrist was more easily accessed than one kept in a pocket. 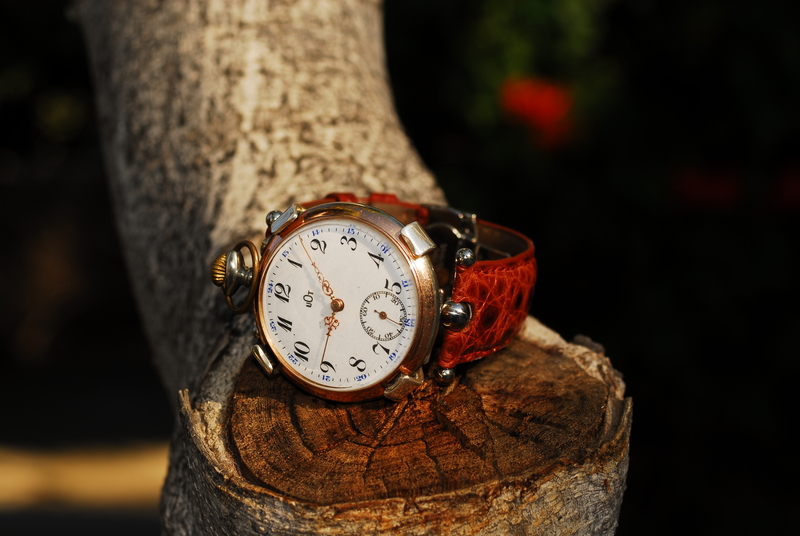 A watch of transitional design, combining features of pocket watches and modern wristwatches, was called trench watch or “wristlet”. However, pocket watches continued to be widely used in railroading even as their popularity declined elsewhere. For a few years in the late 1970s and 1980s three-piece suits for men returned to fashion, and this led to small resurgence in pocket watches, as some men actually used the vest pocket for its original purpose. [ Since then, some watch companies continue to make pocket watches. As vests have long since fallen out of fashion (in the US) as part of formal business wear, the only available location for carrying a watch is in a trouser pocket. The more recent advent of mobile phones and other gadgets that are worn on the waist has diminished the appeal of carrying an additional item in the same location, especially as such pocketable gadgets usually have timekeeping functionality themselves. The pocketwatch has regained popularity due to steampunk, a subcultural movement embracing the arts and fashions of the Victorian era, where pocket watches were nearly ubiquitous.